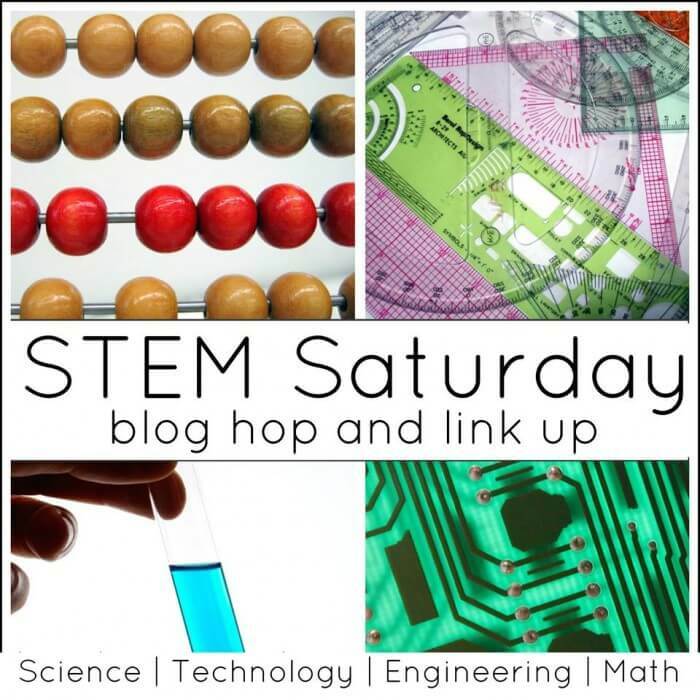 Welcome back for another STEM Saturday! This week we have a special series featuring one of the most important parts of Valentine’s Day.. Hearts! 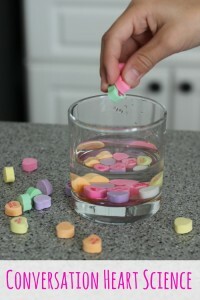 Today we are sharing our classic dissolving candy hearts experiment that is very similar to our dissolving pumpkins, candy canes and peeps experiments. 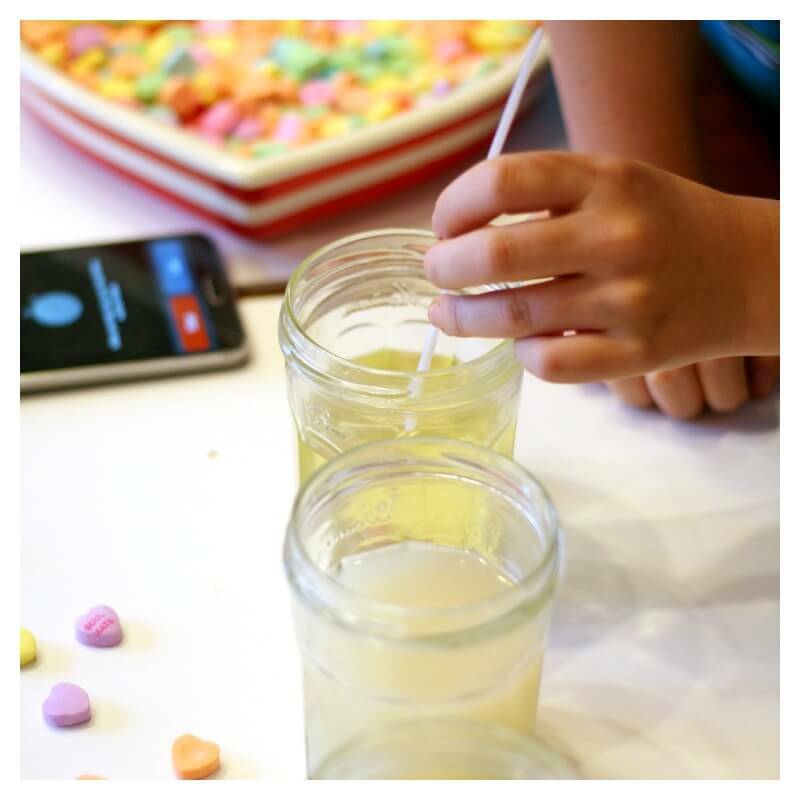 Since I believe in child led experiments, I try to let my kids choose what they want to do and what they are interested in. It seems that every time we have a new material, the first thing the kids want to do is see how it relates to liquids. 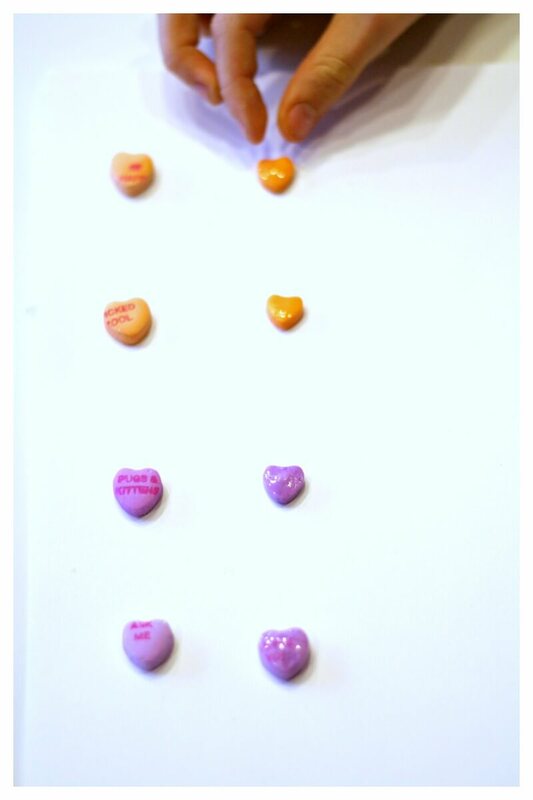 So, that is what we did with our candy hearts! 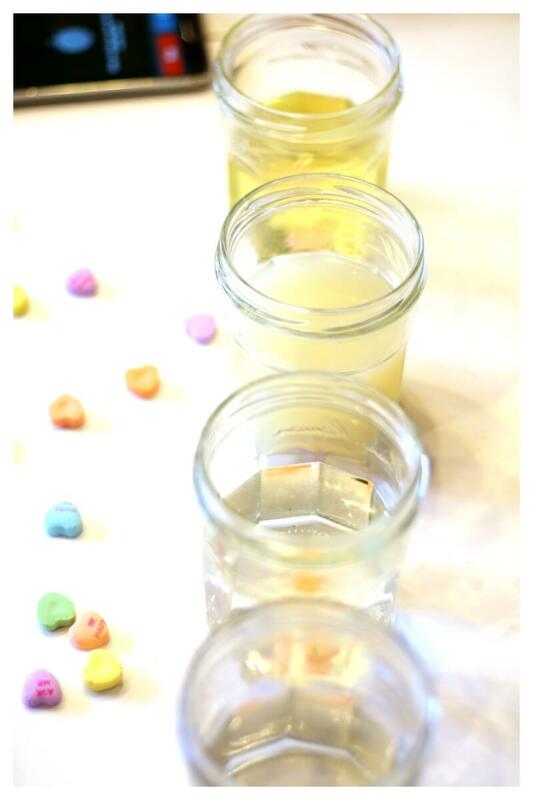 You are going to love this experiment as much as we did! This simple experiment seriously took 2 minutes to set up and was super fun. 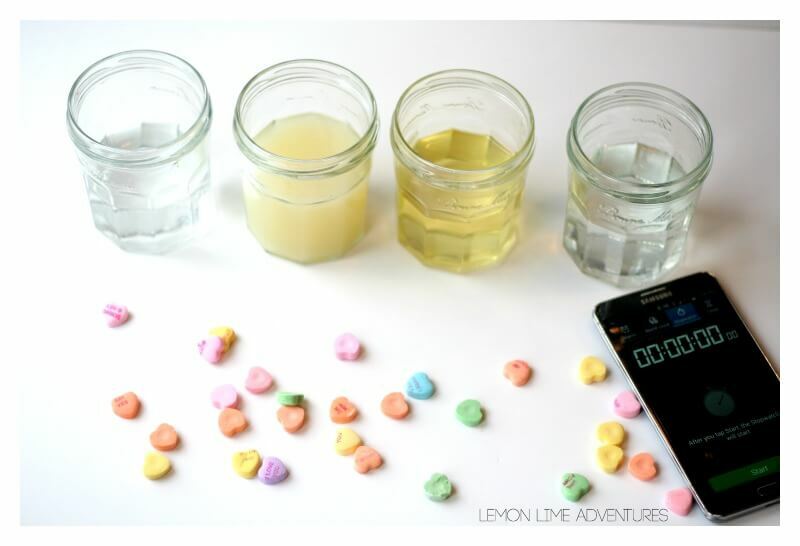 Fill 4 cups up with the same amount of liquid in each glass. Place the candy bowls in a bowl near the glasses for easy access. As with all of our experiments we began with observations and predictions. Because we have done this several times the boys (7 and 9) had quite a bit of background knowledge built up. 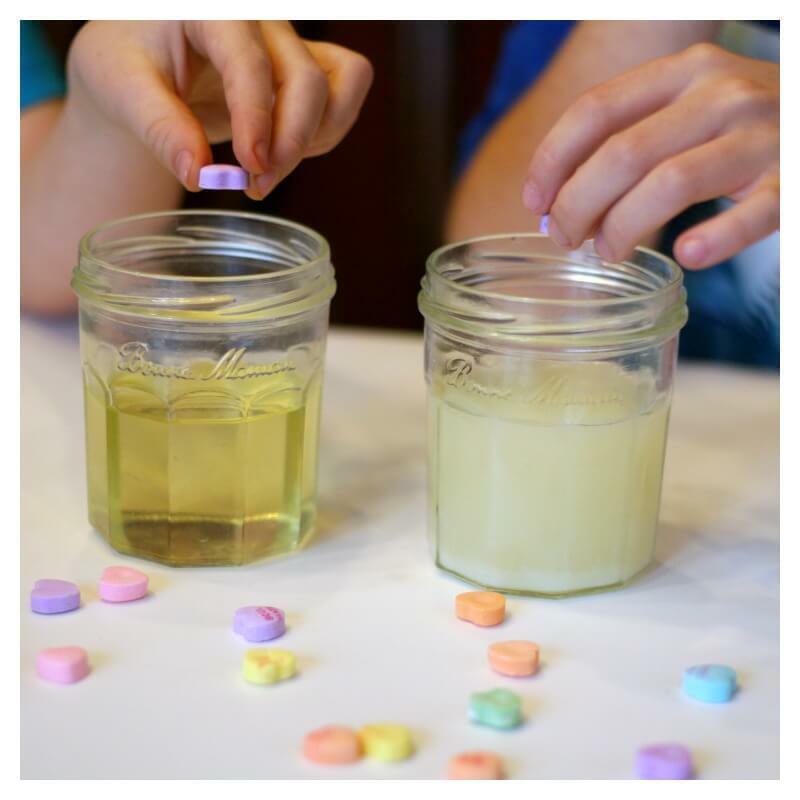 For this experiment, both boys chose to measure the candy hearts before they started and they both drew the jars of liquid. Both boys had very similar predictions. With the addition of the lemon juice, the boys were certain the heart in the lemon would dissolve the fastest due to the acidity and the heart in the oil would not change at all. After the boys were done making their observations, drawing, measurements and predictions, we ere ready to get started. The boys put the candy canes in the jars and started the timer. What happened next surprised us all. After the candy canes dissolved so quickly, the boys expected this change to be just as fast. However, it was a much slower process. At each 5 minute interval they used a skewer to check the hardness of the candies, only to find that they were not absorbing the liquids. The surprising observation was how the candy in the oil changed. Based on their other experiments, this was not what they found, so now they had a ton of questions. There are so many variation to this experiment. The boys are already talking about changing up the liquids, testing what happens when you shake the containers, changing the temperatures, and changing the candies. I love how they are always questioning and looking for new ways to try things out. 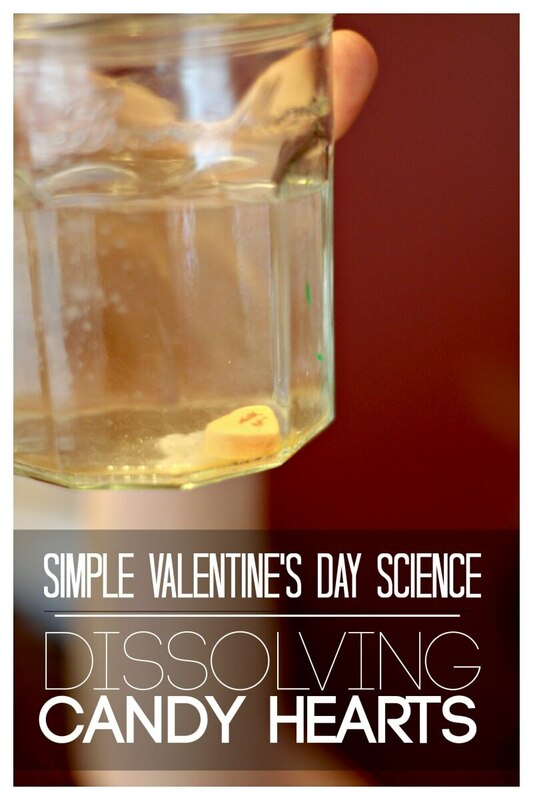 Do you have a favorite Valentine’s Day Science Experiment? I would love to know! Connect with me on Facebook, Twitter, Google+, Pinterest, Instagram or subscribe by email. I can’t wait to hear your ideas.